The Jain Center of Toronto was chartered in 1974 with an objective to provide a forum for Jains to observe and perform various activities related to Jainism, preserve Jain culture for future generations and promote fellowship among all Jains. JSOT currently serves 600 life and annual Jain members. Jain Society of Toronto (JSOT) celebrated Paryushan and Das Lakshan Parva with great spirituality and enthusiasm.Learned Scholars Jayesh Bhai Jain, Jayendra Bhai Naik and Paras Bhai Shah enlightened Jain community by the teachings of Bhagwan Mahavir through their lectures (vyakhyan) and Bhakti Bhavna. There were Snatra Puja in the mornings, lecture/bhaav yatras in afternoons, Pratikaman in the evenings followed by Prabhujis Bhakti Bhavna and aarti. JSOT being the largest Jain congregation in Canada, Jains from different parts of the Greater Toronto Area came together to celebrate Bhagwan Mahavir Swapna Darshan / Janam Vanchan Mahotsav. 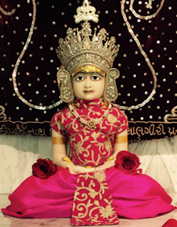 This year the celebration was held at BAPS Swami Narayan Temple, Toronto. 1,500 Jains attended the program and the Swapna Darshan Ghee Boli broke last year’s records. The exuberance and enthusiasm of all the people were remarkable which made the event even more successful. They also had grand Jal Yatra on Sun, 23rd Sept. Seniors play an important role in our families, communities and workplaces. In recognition of this contribution, Jain Society of Toronto ensures an enjoyable quality of life for seniors. The monthly Senior Session at Jain center help them learn, laugh, relax and have a good time. Last Senior Session was held on June 18, 2016, where they recited Namokar Mantra and devotional songs, exchanged their views on the topic, “In all Faiths and Cultures of the World, the concepts of Charities, Donations and Giving Back to Society have existed.” A well-known artist, Prof. Jayndrabhai Nayak from India had sung devotional songs and sugam sangeet, few brain teasers, chit-chat, chuckles and gentle yoga were performed. The session ended with Aarti-Mangal Divo, followed by a light lunch. Jain Society of Toronto had also held Sutra-Pathshala and Snatra Pooja on June 19, 2016.